JAKARTA, Indonesia (AP) — Indonesia's long-awaited first subway opened Sunday in the country's capital with the aim of relieving crippling traffic gridlock in Southeast Asia's biggest economy. Minutes after inaugurating the 16-kilometer (10-mile) transit line running south from Jakarta's downtown, President Joko Widodo presided over a groundbreaking ceremony to mark the beginning of the second phase: an 8-kilometer (5-mile) northward line planned for completion by 2024. The two projects are being built at a cost of $2.6 billion. 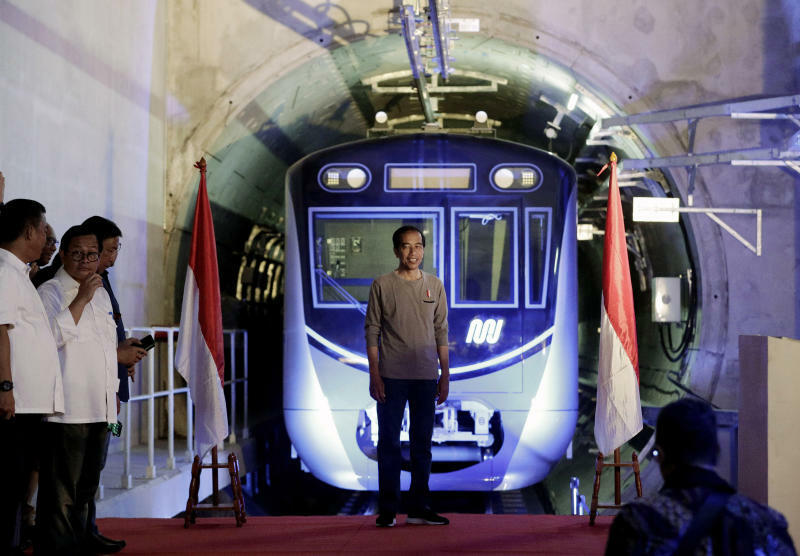 "Today we will begin a new civilization by operating the first phase of mass rapid transit in Jakarta," Widodo told several thousand guests and residents at the inauguration. The line that opened Sunday includes seven elevated and six underground stations built by two consortiums of local and Japanese companies. Passengers can ride for free until the end of the month, after which operator PT MRT Jakarta has said tickets will cost the equivalent of between 70 cents and $1. 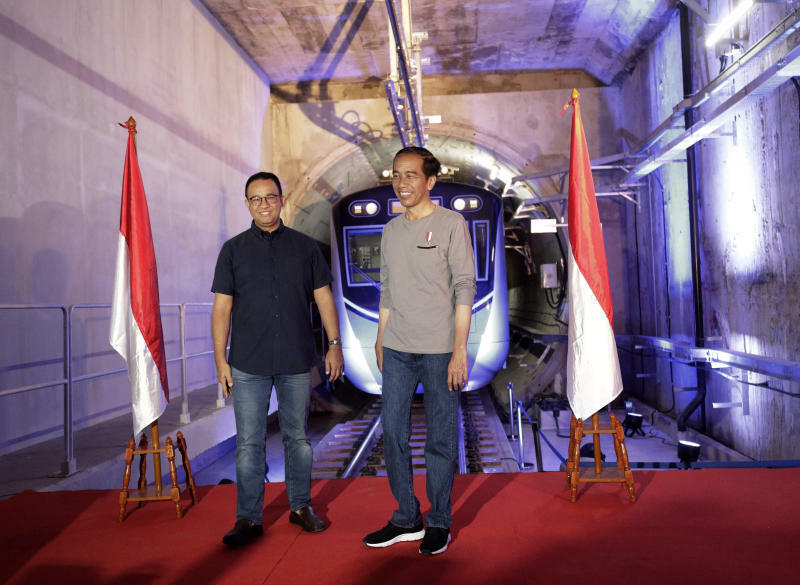 Widodo, who is campaigning for re-election, told the crowd that he has instructed Jakarta Governor Anies Baswedan to begin the next phase of construction of an east-west line covering a distance of 87 kilometers this year. Jakarta's first subway line, the latest of many infrastructure improvements across the world's fourth most populous nation, is aimed at helping it catch up with other Southeast Asian capitals such as Kuala Lumpur, Singapore and Bangkok in public transport. Jakarta is officially home to about 10 million people, but the population of the greater metropolitan area swells to 30 million. The project, funded through a loan from the Japan International Cooperation Agency, has been planned since the 1980s, but its construction was hampered by political crises, red tape and funding disagreements. Widodo was the Jakarta governor when construction finally kicked off in October 2013. JICA has predicted that without a major investment in transportation, Jakarta would be overwhelmed by traffic jams by 2020. Annual losses from congestion are forecast to reach $6.5 billion by next year. Congestion has relentlessly worsened in the past decade as car ownership rose, squeezing more and more vehicles onto Jakarta's unchanging road network. The average peak hour speed has "significantly decreased" to 10 kilometers an hour (6.2 miles per hour), according to the transport ministry. It often can take two or more hours to move 5 kilometers (3 miles) in some pockets of the city. The line opened Sunday runs from the southern neighborhood of Lebak Bulus to Jakarta's downtown and is expected to take less than 30 minutes. In addition to the subway project, a $2.4 billion elevated rail network linking Jakarta and its satellite cities is also taking shape, with the first stage expected to begin operating in April. But it likely will take several years for new transit systems to make a dent in the congestion. About 1.4 million people commute into central Jakarta on work days. The initial subway line aims to carry only about 130,000 people a day by the end of this year.